Problem clicking the button above? We've got a treat for you... all of you who remember the Rat Pack. 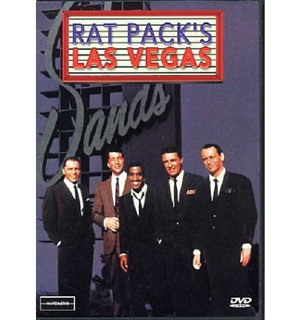 A video clip about the Birth of the Rat Pack taken from the DVD we're featuring at more than 1/2 off. Just visit any of our links for the DVD and you'll see the video as well as get the special price on it. the pack at the fabled Sands "A Place in the Sun" Hotel, to the triumphant on-location filming of the Pack's "Ocean's 11" (which showcased as many stars as could make it to Vegas during the filming). The DVD features rare footage of the Pack in action at the Sands' Copa Room as well as rare stills of John F. Kennedy and other Kennedy Era luminaries. It also offers frank discussions of the racism that dominated Las Vegas in the 1950's - and Frank Sinatra's heroic efforts to end it for his good friend Sammy Davis Jr.
From the birth of the Sands to its razing to make way for today's fabulous Venetian Resort Hotel, the "Rat Pack's Las Vegas" showcases the men and times that built the myth - and mystique - of America's No. 1 tourist destination. Grab your DVD for $9.73 by visiting us and watch the video too. We are available M-F 8:00am to 5:00 pm Central time.